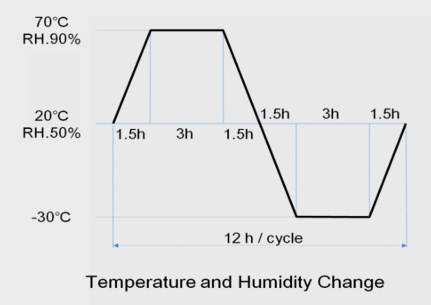 The change of the contact angle of a HIREC coated surface was measured in Temperature with Humidity Cycle Test. The test was done for temperature range from -30°C to 70°C, humidity up to 90% R.H., 12 hours/cycle, and 100 cycles. The test result showed the HIREC has a stable performance in the temperature with humidity cycle test and has high durability. The contact angle was stable during the temperature with humidity cycle test. The contact angle was 149° after the test. HIREC maintains highly durable super water repellency in the temperature with humidity test.